Sky Art! 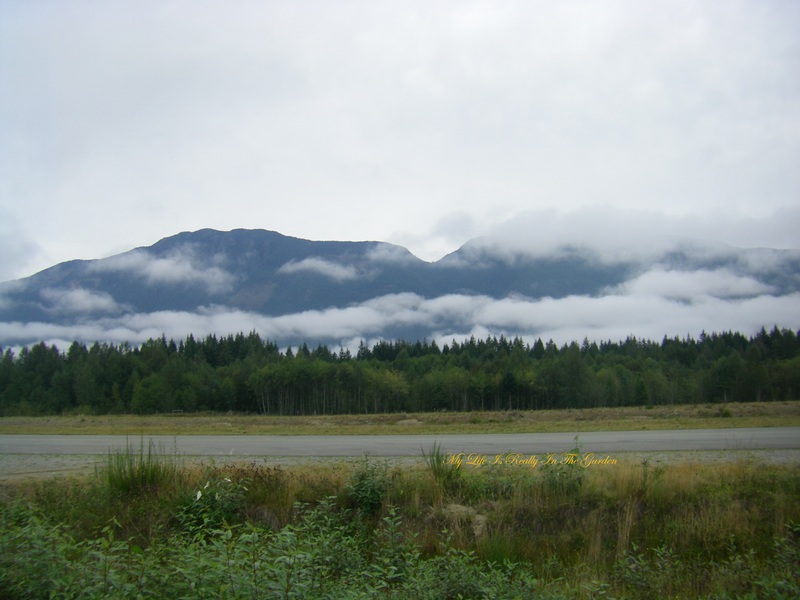 We flew to Comox Airport – and we met some very interesting people! Honestly, the clouds were so dense in areas that they seemed to be just like cotton candy that one could just nibble on. A firm surface that could be ventured on for exploring the mysterious caverns and pathways that seemed to exist there. 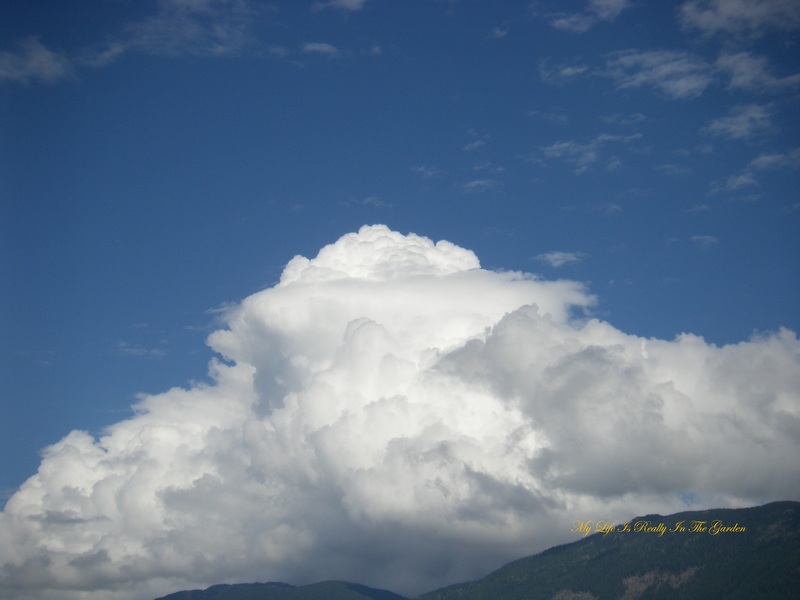 Towering cumulus clouds everywhere .. this was a close-up of a much bigger area. Sometimes I did look down and noticed this fish hatchery. At first glance I thought it was an irrigation method for watering crops, but DH did a bit of research and found out what it really is. 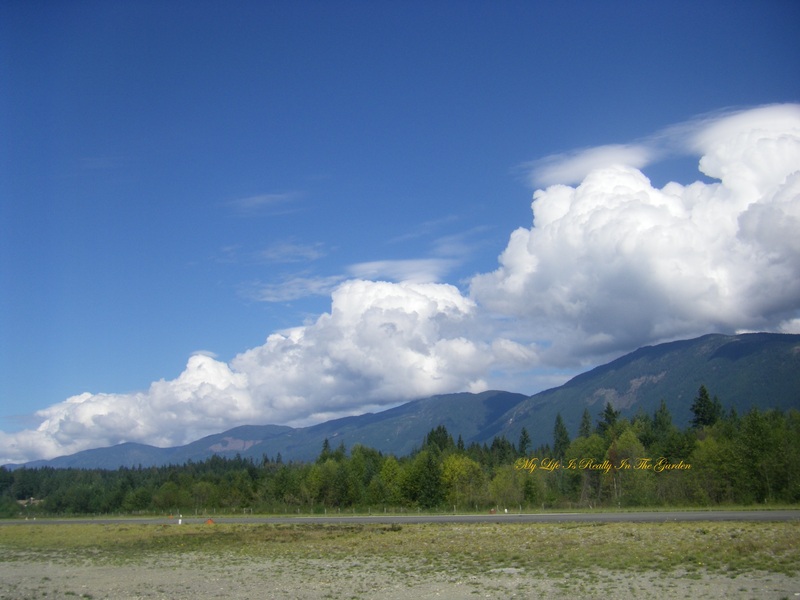 We went to the Courtenay Airpark .. such a place of beauty and friendly people. Plus I had a lovely kindred spirit conversation about creativity and art with a young lady who works at the Cafe there. I love those energizing types of idea sharing along the artistic wave length. Such beautiful surroundings … many people walk, run or bike by themselves, with friends, family, dogs (love them!) along the pathway that surrounds the marsh … so very relaxing. And we were fortunate enough to meet some highly interesting people! http://www.daleerhart.com/ A fellow pilot was just telling us about Dale Erhart when himself arrived a few minutes later (in this plane that he built). No sooner had he jumped out of the plane (the opening is not that large, so one has to be fit to enter and exit!) .. then he was on his phone, calling his wife … That is sweet!!! And shortly after this, he departed, to join up with the other members of the group of 4. And soon were in the “land of clouds”once again .. flying amongst the sky art that I normally see from the ground ..
Back home .. loving the sweet Robin and Sparrow who rest atop our first Christmas tree .. over 30 years ago DH planted this tree in front of our house. It provides privacy and a haven for many birds to live in. Provides me with joy and happiness because of that. Beside this tree is a cedar that I also planted .. perhaps a bit too close, but what did I now way back then? All the trees live well together. A lovely ending to a wonderful day. Now on with this day .. lots to do!! 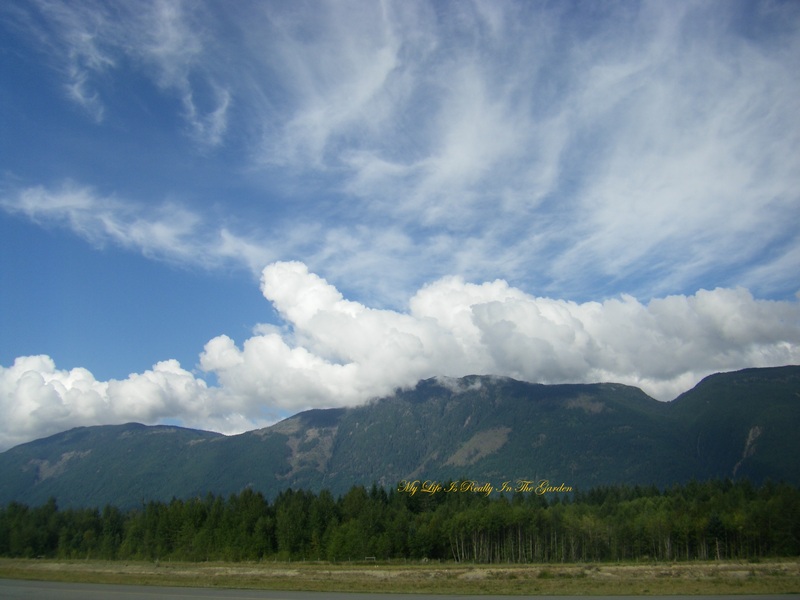 Categories: Gardening, Positivity | Tags: clouds, Comox airpark, enthusiasm, fish hatchery, happiness, marshland, motivation, Robin, sky art, sparrow, Vimy Ridge, WWI fighters | Permalink. 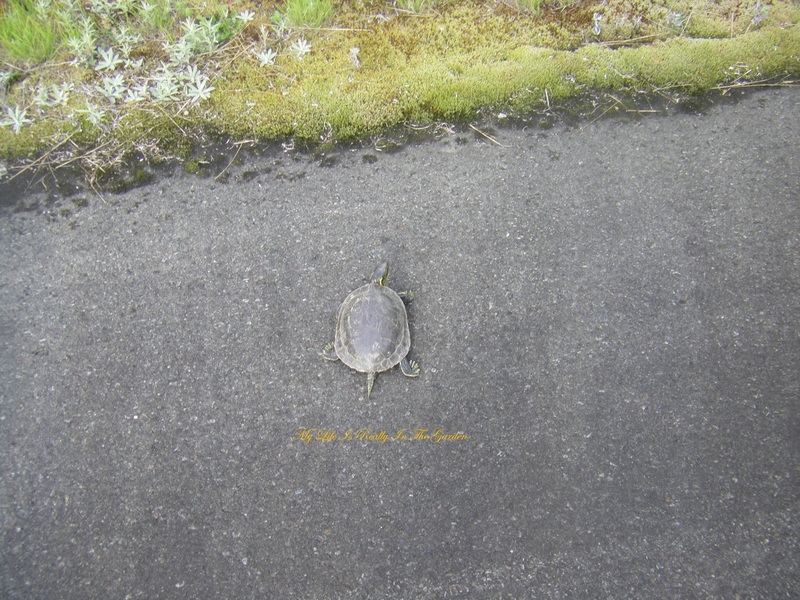 What does a turtle on the runway, spider webs, tree frogs and sky art have in Common? They are just some of the many things I love! Today is a rainy, overcast day. The sun came out for a nano-second and the skies are grayed over. Perfect time to look through some photos from September, 2013! 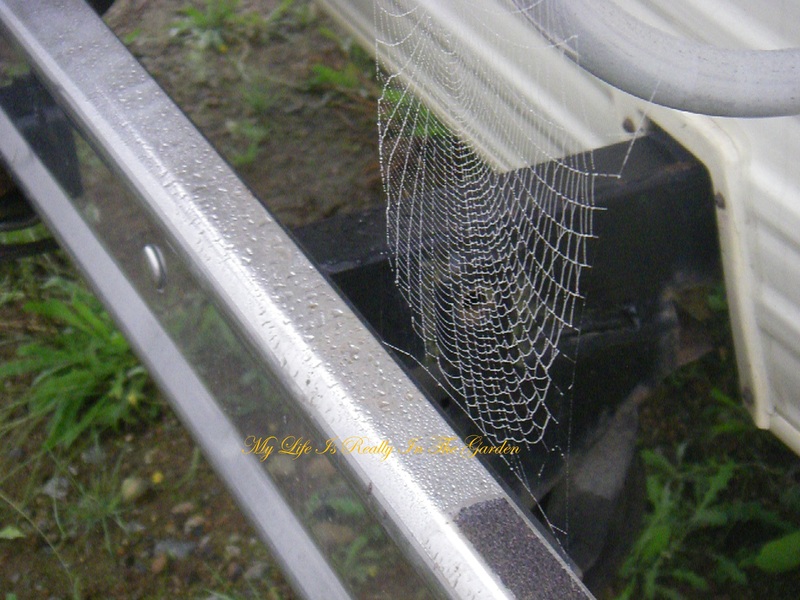 This is a morning picture of a web that a spider had worked industriously on during the night. Such delicate strands, pattern by Nature, instinctive in the spider. How could a human being create such beauty and delicacy? Only with much study and hard work and certainly not in the time that it took the spider to create this. Humbling? You bet. Impressive. As I went to move our lounge chairs into the sun .. 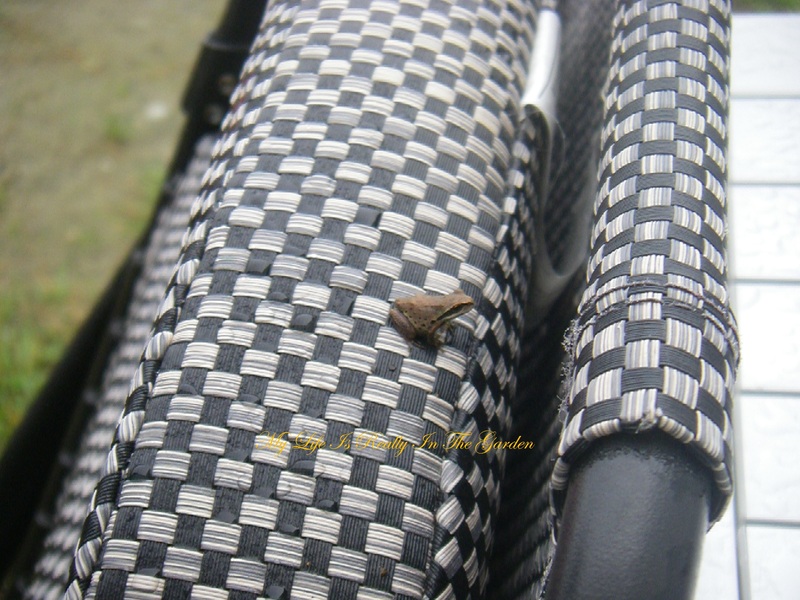 I noticed a tiny little tree frog had taken up residence. So sweet and so confident, not afraid of my presence. Calmly resting on “his” chair. I left him there to relax. 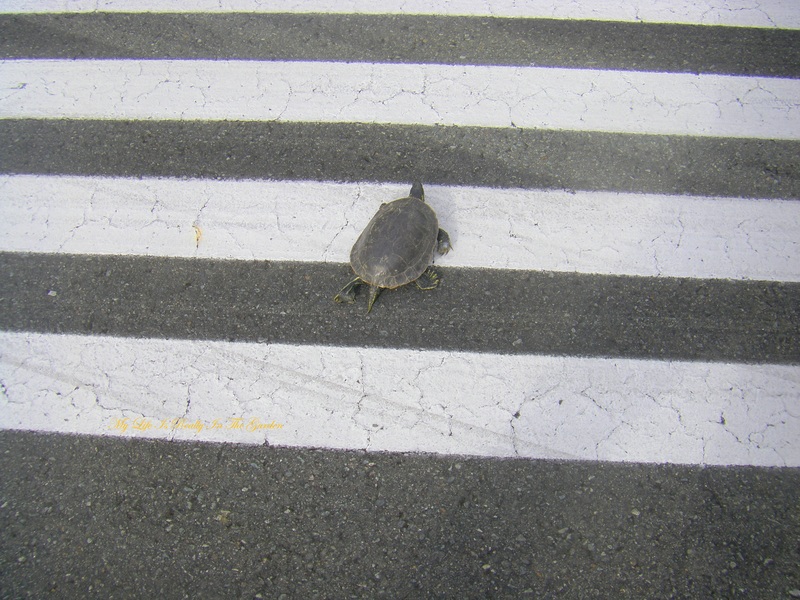 We noticed this turtle wandering all over the runway and I tried to guide him on a straight path so he would reach the other side. Really, why was I worried, as he must have made this trip many times. 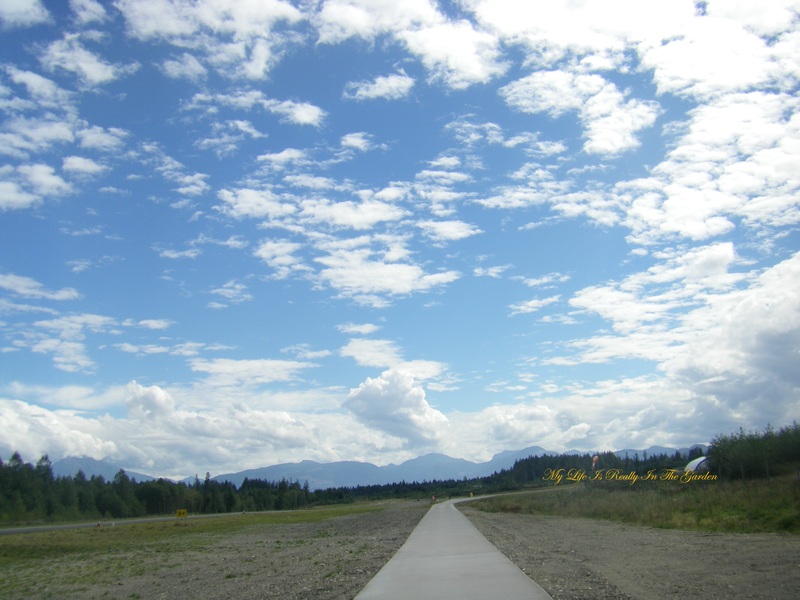 Travelling from a trickling stream nearby to the forest on the other side of the runway. Let me mention (and this is important) .. the runway was not active at this time. However, I did breathe a sigh of relief when he was at the other side. And then the excitement was over, he’d reached the field and made his way to a destination that only he knew. Back to the wife and kids? Out for lunch? Later on I spent some time watching some industrious bees foraging for nectar. These plants are growing in very hot countryside and they are very tiny. 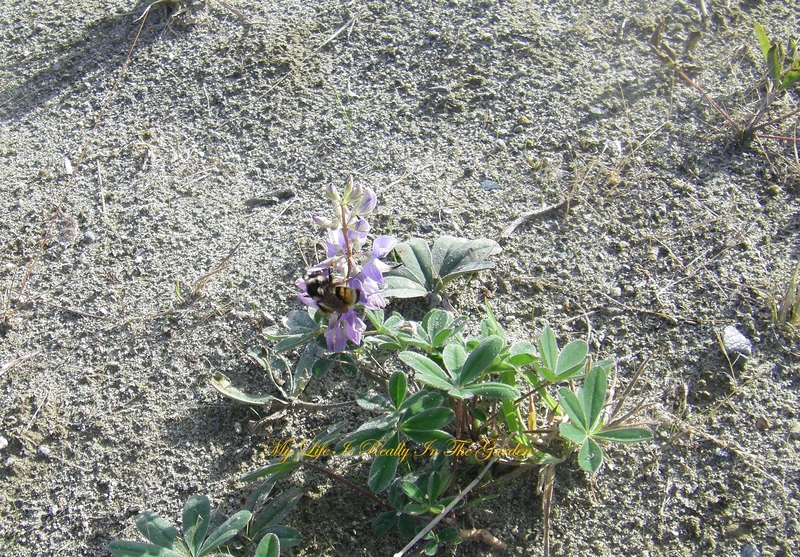 Nevertheless, there is sufficient nectar to attract the bees. Morning skies are filled with low clouds at Mt. Arrowsmith. Later that summer, I flew up there as a passenger in the front seat of the PW-U6 and we flew so close, I clicked away like mad and have lots of photos from up there. I’ll post them at a later date. I was filled with awe at the proximity of this most magnificent mountain. And I felt truly grateful at having the opportunity to be up there. 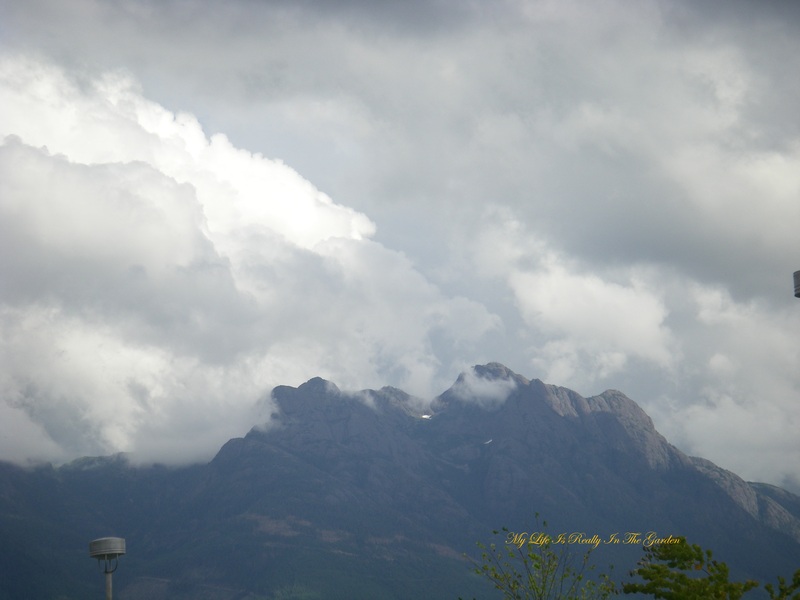 Later in the morning, the clouds begin to lift and the Beaufort Mountain Range is becoming more visible. What a view. See what a difference a few hours make. 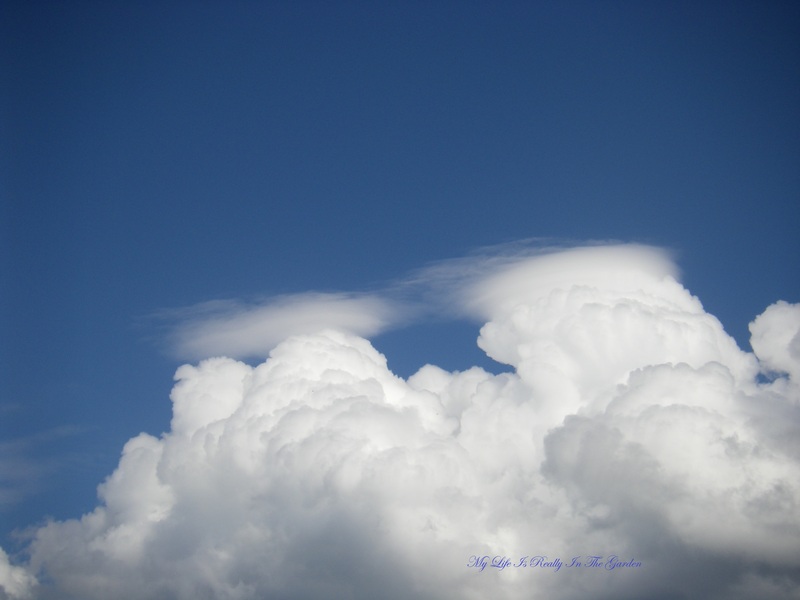 I’m enamoured of skies and clouds and have many hundreds of photos to look at. This one is another spectacular sight. These photos don’t need words. These priceless works of sky art are beyond words. Their beauty is infinite. While stopped in traffic, I noticed this licence plate .. a reminder of my lovely Muscovy Drake, Huggers, Hugs for short. He was a great little duck. I used to keep a silver tray at the kitchen window. On it I had a little bowl of water, some grapes or strawberries. He liked to sit at the window outside. When I opened the window, he would eat and drink as if he was at a fast-food restaurant. He was a character. He grew up with our 2 dogs and he really thought he was one. Anyway, this reminded me of him. Beauty is everywhere .. we are surrounded by it .. if we only look. 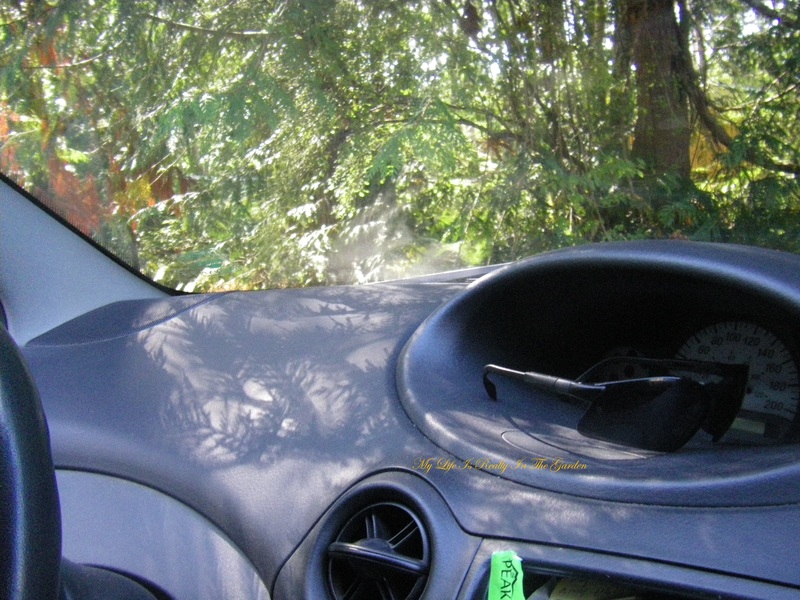 Here I like the shadow of nearby cedar boughs, outlined by the sun onto the dash of my car. And, while looking through my photos .. 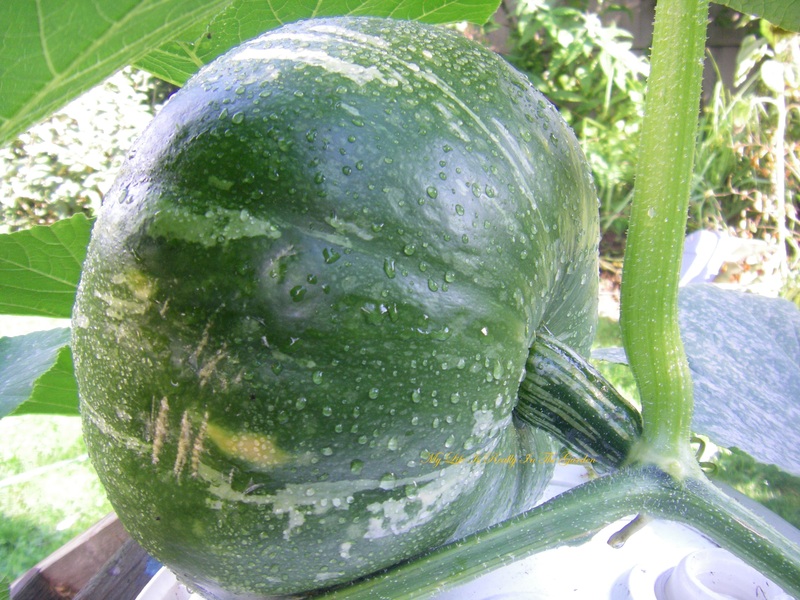 I found some terrific views of my squash plants growing away. Awesome .. from a small seed we obtain this delicious food. Miracles happening all the time. 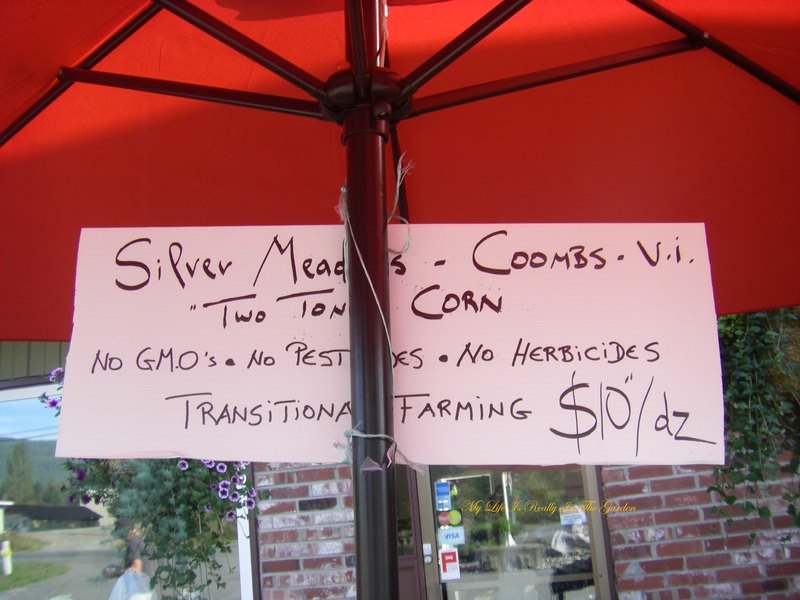 In particular, non-GMO, no pesticides …. ever! I was outside, every single day, looking at my treasures, so proud! And this is a lovely sight! A little pricey, but you get what you pay for and non-GMO is worth it. I am so glad that I am able to take so many photos of things that I love .. for days like this, I can look through them and relive the joy of every day. And they are also incentive for the next year of growing, watching sky art and finding beauty in everything I see! 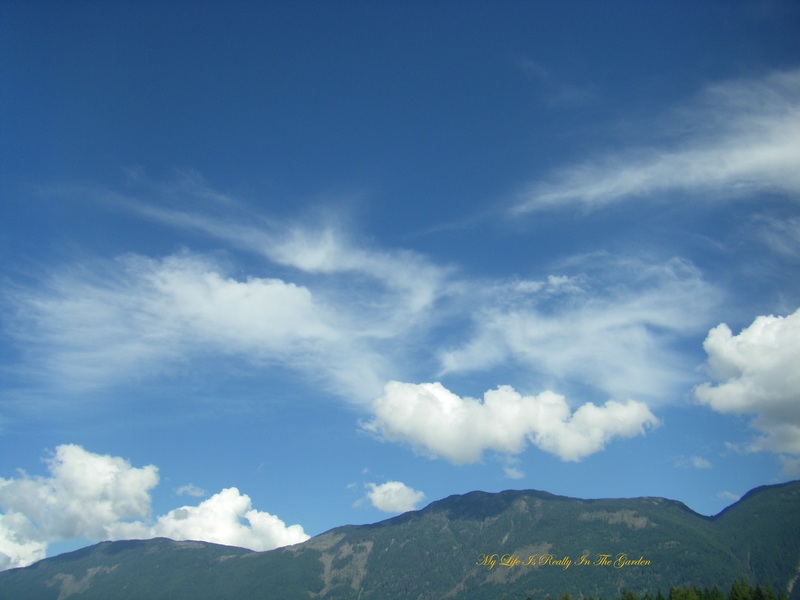 Categories: Gardening, Positivity | Tags: Beaufort Mountain Range, bees, clouds, growing squash, mountains, Mt. 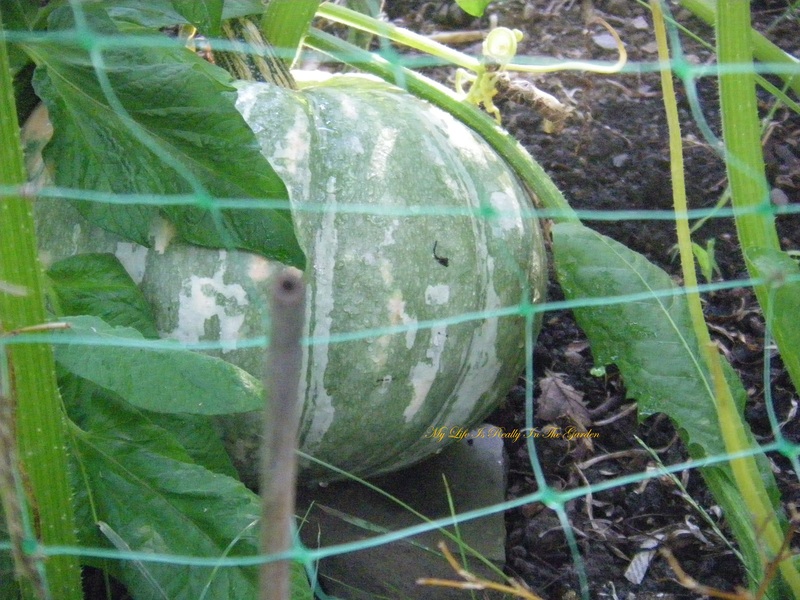 Arrowsmith, non-GMO, sky art, tree frogs, turtles | Permalink.